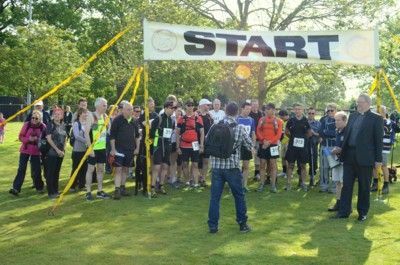 The Rotary Club of Cranleigh, together with Informed Choice and various local organisations, is pleased to introduce the Cranleigh Trail Marathon, Half Marathon and Challenge Walk which will take place at 9 am on Sunday, 14 May, 2017. The events will commence at Bruce McKenzie Playing Fields, off Knowle Lane, and finish in the Snoxhall Playing Fields. Originally created as the Cranleigh Parish Boundary Challenge, the event has evolved into a two-lap trail marathon (26.2 miles), with one lap being for half-marathon runners and a challenge walking route. The well-marked course is entirely on public footpaths and every participant will receive a custom designed medal. Participants in the event will experience wonderful views across Cranleigh and The Weald as the route takes runners and walkers through the Surrey Hills and Winterfold Forest. Refreshments will be available at The Band Room on Village Way. A spokesperson for Cranleigh Rotary said: "Not only do these events generate important funds for local and other charities but they also provide stimulating challenges for both 'serious' and occasional runners and walkers from Cranleigh and surrounding communities." Commenting on the event, Nick Bamford, founder of Informed Choice said: "I am delighted that we are sponsoring the Cranleigh Trail Marathon for a 3rd consecutive year and so help raise money for the Cranleigh Rotary Club's charities, both local and international. We hope there is a really good turn out and that the weather is kind to us this year." Online entries are now available at www.cranleighchallenge.uk and paper entry forms are available from Informed Choice at 20 High Street, Cranleigh.